It is with great sadness we the family of Irene MacInnis, formerly of Rockdale Avenue in Sydney announce her passing on Sunday, January 7, 2018 with her family by her side, at Steelworker’s Lane, Harbourstone Enhanced Care where she resided for the past 12 years. Born in Sydney on July 26, 1920 Irene was the daughter of the late James and Bessie (Steele) MacInnis. She was predeceased by sister, Florence (Tibby) Morrison, and brothers, Hughie (Margaret) MacInnis, Allister MacInnis and Raymond MacInnis. She is survived by her sister, Cecilia Camus, Montreal; by her special nephew whom she considered a son, Cliff ‘Cliffie’ Morrison; his wife, Joyce, and chosen grandchildren, Scott (Karry) Morrison and Gayle (Chris) Barnett, and special chosen great grandchildren, Karis, Kashen, Gia and Ryder Morrison. Also surviving is her niece, Judy Haley, Sydney; great nieces, Natalie Bresnahan (Scott) and Melissa Haley (Matt) and their families. She is survived by many other nieces and nephews throughout Canada. In her younger years, Irene was employed at the Normaway Hand Crafts, The Treasure Cove and Cunningham’s. 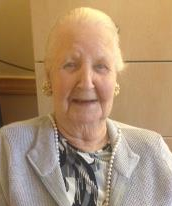 She was a lady of great humor who enjoyed nothing more than a good joke and a laugh which endeared her not only to her family and friends, but also the residents and staff of Harbourstone. Irene enjoyed life to the fullest and her presence will be sadly missed by all who were blessed to have her as part of their lives. The family would like to extend our heartfelt thanks to the staff of Steelworkers Lane for all their care, compassion, love and support for Irene “the Queen” as they fondly called her over the years. Cremation has taken place and a chapel service will be held on Thursday, January 11, 11 a.m. at T.W. Curry Parkview Chapel with Fr. Duaine Devereaux officiating. Family Burial at a later date at Holy Cross Cemetery. Donations to charity of one’s choice. Online condolences may be made by visiting www.twcurry.com.